This carefully crafted ebook is formatted for your eReader with a functional and detailed table of contents. Leonardo Wilhelm DiCaprio ( born November 11, 1974) is an American actor, film producer, and environmental activist. DiCaprio began his career by appearing in television commercials in the early 1990s, after which he had recurring roles in various television series such as the soap opera Santa Barbara and the sitcom Growing Pains. He began his film career by starring as Josh in Critters 3 (1991). He starred in the film adaptation of the memoir This Boy's Life (1993), and was praised for his supporting role in What's Eating Gilbert Grape (1993). He gained public recognition with leading roles in The Basketball Diaries (1995) and the romantic drama Romeo + Juliet (1996), before achieving international fame with James Cameron's epic romance Titanic (1997), which became the highest-grossing film of all time until Cameron's science fiction film Avatar (2009) overtook it. 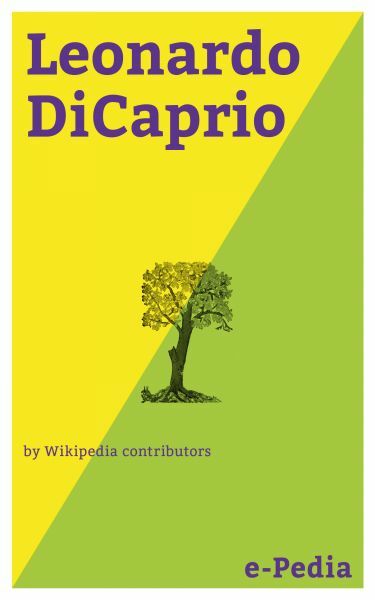 This book has been derived from Wikipedia: it contains the entire text of the title Wikipedia article + the entire text of all the 775 related (linked) Wikipedia articles to the title article. This book does not contain illustrations. e-Pedia (an imprint of e-artnow) charges for the convenience service of formatting these e-books for your eReader. We donate a part of our net income after taxes to the Wikimedia Foundation from the sales of all books based on Wikipedia content.